St Johns Harrow » Advent 2 : What kind of God do you have ? 10 See, the Lord God comes with might, and his arm rules for him; his reward is with him, and his recompense before him. 11 He will feed his flock like a shepherd; he will gather the lambs in his arms, and carry them in his bosom, and gently lead the mother sheep. Recently I have been inviting some reflections and questions in our Sunday services, especially our landmark festivals. Is Christ the King merely a religious title, or is He king? Is Advent just a race against time to Christmas, or a reminder that we are a perpetual Advent people, serving Christ the King until he comes again? Today’s question is: What is your picture of God? How do you see Him? How do you imagine him to be? I want to suggest today that, no matter what it looks like, God is a compassionate God with a loving purpose. That purpose is always to see you set on, or back on, the path to become the person God wants you to be. It may be that one or two or you need to hear that in a new way. Perhaps we see God differently. Perhaps He is not involved at all – the absent landlord of your life. Maybe, on the other hand he is all too involved – watching every mistake you make, and judging you. Why is this important? Because the way you see God will influence everything else – both your attitude to worship and the way you relate to others. It is only when we know we are loved that we can love. If we cannot love others and the world cannot be changed by us, we can’t be agents of the kingdom, and so the world stays as it is. Isaiah brings to the people of Israel, the voice of God some 700 years before Jesus. This passage is known to bible scholars as the start of the “Book of Consolation”. Isaiah 1-40 is written at a time of prosperity in the two kingdoms of old Israel – north and South. But although things looked good on the surface, in God’s eyes the nation was bankrupt. There was idolatry in the north and nominal religion in the south. There was corruption in the priesthood and wickedness in the leadership. And something which we must ever forget, there was widespread social justice. God says the, and he says now, unless you treat your neighbour as you treat yourself, you cannot worship me with any integrity for in your treatment of others do I evaluate your alleged worship of me. So God announced through the prophets that the covenant announced in Deuteronomy had been broken, and that He would…..well, He would what? How do we interpret what happened next? God makes a covenant in Deuteronomy 30 It is mutual commitment – love me and I will bless you. By Isaiah’s time, the covenant has been neglected so much it was broken, and God needed to act. then virtually cast aside, as if forgotten. Israel as a nation no longer reflected its calling to be the messenger of God’s love. So God decreed that the covenant is so broken that thing must be mended. So what happens is first the northern kingdom and then the southern kingdom is defeated in war, and the people are deported to exile in Babylon, where However, the people, though exiled are not destroyed. The exile to Babylon is not designed to end Israel but to restore her to God. The exile represents an earth shattering change of circumstance for Israel’s people – defeat not just represented not just a loss of God’s blessing, but the defeat of God himself. The Temple is destroyed and the golden cups and serving bowls from the Temple are now used for drunken carousing in the court of Babylonian Kings (Daniel 5:2). Temple sacrifice is ended and so is the perceived atonement of God – the identity of Jews has gone. How would you see Yahweh in that circumstance? Surely they felt either abandoned or punished, or maybe that God is absent or even that God had been defeated! How do you feel here, today? Look at the world around you. Look at the Christian witness in this land, indeed in Europe and the West as a whole. Apart from China and Africa, how do you perceive the rule of God to be? It is easy to be discouraged, and to feel that the Christian mission in the west is at and end. . Our identity as people of God sometimes looks forlorn, and futile. Worse, our daily purpose looks like a lost cause, and because we are a creature of purpose, our joy and happiness is diminished. However, if the exile was simply God getting vengeance then there would have even no need of restoration; it would have been the end of the story. God could have allowed Israel to simply vanish from the history books, and choose another way of providing the Messiah. But instead of destruction, God used the powers of the world to provide a way back. Why? Because God is not a god of contract, he is a God of covenant. God’s promise is not a legal contract, it is a holy promise. 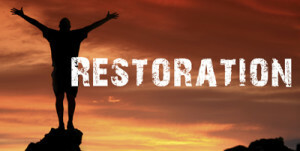 Israel had been promised, so God would restore her. God has made promises to you and He will keep them. The exile that brought them to Babylonian also brought them to their senses, and most importantly to their knees – exile produce psalms, the OT text as we have it now, and crucially, a renewed desire to return to the land and serve God and a new commitment to social justice. The experience changed their hearts for the better. During the course of the next 70 years, Israel was freed and restored, and became different. Because God loved his people whatever they had done. God’s love for us is unconditional, and so strong he is willing to endure pain in order to see you come back to Him. Peace on earth goodwill to men is the motto of the season, or one of them. But the global situation always looks a long way from that reality, doesn’t it. But perhaps we are reading that phrase wrongly. Peace on earth starts with peace within yourself, as between you and God. Good will to me flows from that place of self forgiveness, assurance of the love of God for me, and a settled mind and heart that is realistic about sin, but not condemn or burdened with guilt. Just as John’s voice cries out, “prepare a way in the wilderness” and we need to prepare the way for Jesus to come into our lives in a new way. And that means seeing God in a new way and appreciating afresh that he is the God who reveals himself in Christ, not necessarily the one we have painted for ourselves in our hearts, usually because we cannot forgive ourselves. He comes as a God of power, subduing all things before him. But it is a very special kind of power. “He is like a shepherd feeding his flock, gathering lambs in his arms, holding them against his breast and leading to their rest the mother ewes”. What a beautiful image, one that Jesus will develops, calling himself the Good Shepherd (cf. Matt 18:12-14, John 10:11-18). And it will not be a coincidence that the first people to pay homage at the stable in Bethlehem will be shepherds. Prepare for the coming of the Lord by understanding why he is coming – to restore and renew.